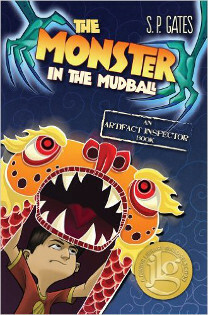 This is an action-packed chapter book about a monster that escapes from an ancient mudball into modern England, and the efforts of a couple of kids and one seriously cool Artifacts Inspector to recapture it. The characters in this story are diverse- the kids are Asian, the Artifacts Inspector is African, and the lead character Jin has dyspraxia- but this never feels forced, and in fact is often quite integrated with the plot. I bought the book for my older daughter when she was on a mysteries kick, and I was looking for something different for her to try. She really liked the book, but she found it a bit scary (she was seven at the time). I was curious, so I read it, too, and I also liked it a lot. There are certainly some tense moments, but the magical nature of the plot and the fast-pace at which the action moves make me think that most kids would not find this book too scary. My daughter did finish it, whereas she’ll often abandon a book she finds too scary. When I asked her why, she said she wanted to finish it because it was such a good story. I agree, and am hoping this turns into a series with the wonderful Artifact Inspector Mizz Z as the anchor character.